I'll be the first to admit that I am a horrible drafter. I open my pack of cards, flip to the rare, and if it catches my fancy, chances are I am going to windmill slam that card into my pile. Everyone hopes to get something broken in the first pack. Bomb rares make it easier to draft a deck, and they really give you a higher sense of optimism. Yeah, I have Damnation, no way am I going to get beat. I've said that before, and let me tell you, it is disheartening to lose when you could not find the crucial card you need to stave off defeat. I've drafted for years now, and sometimes I sit back with what I think is a good deck only to lose? How do I know I am valuing cards the right way? I started off with two draft sets, both of them Time Spiral, because it is the most relevent at the moment, and wanted to see how much I could draft. How far could I take these draft sets today? I have a goal, it's not going infinite on MTGO, as I think that is just far to mythical for me at this time, but I want to see my limited rating a lot higher. I'm closer to 1900 in real life (Remember my sealed deck article? Yeah, I got busted sealed decks, and won a lot.) but I know that my rating my be a bit misleading. Here are my goals for this project. In three months time, I want to have a limited rating of over 1700. I know rating means next to nothing, but I like really big numbers. I want to have a better grip on the limited format. I want to know which cards are the best in each color, and what strategies are best for me and my play style. In this three month period, I would like to also gain enough cards for a competant constructed deck. So with that in mind, let's take a look at what I drafted, and how things worked out for me. I need help to get better, and there really are few ways to get better at the limited side of game, outside of just drafting. I recently say down in the 4-3-2-2 queues (And I played there because really, I am too afraid to play in the 8-4 now. I feel like it is wasting money.) and drafted until my eyes got sore from looking at the monitor. I am using the Draftcap program to record my drafts, and present them to you all. However, Draftcap sometimes misses some cards in the packs, I've done my best to remember what I could have picked, but if there is an asterik, I do not remember what I passed. I hope that what I do will be able to present some awesome discussion about what I am doing wrong! Needless to say I did not do as well as I had planned. Okay, I do know that one of the relevant cards in this pack was Firemaw Kavu. I agonized over my pick here. I love Empty the Warrens, because the storm mechanic is so just ridiculous. Bonesplitter Sliver puts me into an aggro sliver build, and I could go the Virulent Sliver route if I decided to. Firemaw is just the best red card in the pack though. What I should have picked: Firemaw Kavu. Another solid pack, although there was no real red card for me to grab here. I did not want to grab the War Marshal this early. I thought about Temporal Isolation, but I do not really want to be the Red White drafter, so I went with Telekentic Sliver, kicking myself for passing the Bonesplitter Sliver. 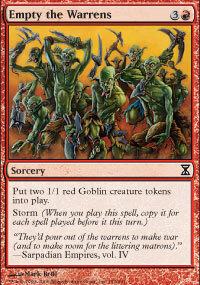 However, I think the best card for me was not the Sliver, but Temporal Isolation. One of my bigger problems is trying to stray away from deck types, but even with Isolation (which could have been a splash), I commit myself to Blue. I think I took the best blue card here, considering I was basically forcing myself into Blue Red. I like the ability to filter my hand with the Looter. If I had grabbed the Isolation, I would have gotten the aggressive Benalish Cavalry. At this point in the draft, I am beating myself up badly. I think the red has been cut by another drafter, and the white seems to be pretty open with Ivory Giant and Celestial Crusader hanging out in the pack. I should have changed my strategy here, instead of forcing Blue Red, I could have kept my options open, and looked more into white. What I should have picked: Ivory Giant. See what I mean about forcing a deck? Amrou Seekers is a solid creature, has a really good form of evasion and should have signled to me that White was being underdrafted. What I should have picked: Amrou Seekers. I like the Cannonade. I think it is really cute removal. Tolarian Sentinel was more than likely the correct pick, Cannonade does not kill much in the format in the late game, where as I can get cute with the Rescue on a stick. What I should have picked: Tolarian Sentinel. I have began to appreciate the Bladescout more and more in limited. Often enough I get one of large guys in a blocking situation and this guy comes down to leave me with my large guy instead of trading men. Tendrils was a hate draft. I have no problem main decking Cancel in limited. It's a very good card that may not make all the main decks, but can crush post board. What I should have picked: Cancel. I took the Shadow Sliver because I decided that I could try to draft a Sliver subtheme. What I should have picked: Blazing Blade Askari. Pack 16: Of note here, is a pack error, I was not able to find here in Draftcap, but I did end up drafting a Boom//Bust and a second Dead//Gone. I have no idea what went wrong, but I know the program sometimes has a problem with split cards. Also, I might have turned the program off on accident, I'm really green when it comes to new programs. It turns out that I did miss recording the real pack sixteen, now the numbering is off, but I will let you know what I first picked here. Man, if I were white I could have had one of the better blockers in the format, Magus is just nutty insane against the fast decks of the format, it ties up their mana and allows you to get back into the game. Had I been in white, this would have been tempting, but since I had red cards in my pile I picked the Stingscouger. I felt that I needed removal, and as of that point, the deck was really lacking in it. Battering Sliver keeps with the Sliver subtheme. It also seemed to be the best card in the pack. I am sure that Pongify was the best pick here. I have a special place in my heart for the Phantasm, but like I said earlier, I need removal. The removal keeps coming and the best common in my opinion made it's way into my draft pile. Synchronous Sliver is another solid body that allowed me to play on the sliver subtheme. Man, if I were in White, I think the deck would be much better. I should have drafted the Woodreaders here. I did not have many ways to deal with big butted men. There was no way I could mess this pack up. Gathan Raiders has been called the best common in the set, and he was drafted to my team. So I took the rare. Remember what I said about getting a constructed deck? Well that Grove blinded me. Spin into Myth and Blind Phantasm would have been better picks. What I should have picked: Spin into Myth. Really beating myself up about not being in White. I love Field. I like the cute removal of Second Wind. I imagined scenerios where War-Pride came into play with a board full of my men. I did not like what resulted in my mind, so I took it. I should not have, because I did have answeres to the uncommon, but habits are hard to break. Again the Liminid was my pick. I looked at it, and realized that it mocked me for not being in White. At the very least the Ignus could at least up my storm count, if Empty the Warrens were to play a factor. So this is what I ended up playing in my main deck. Well, I have to chalk this draft up to learning expirence. I lost in the first round, and sadly it was a bloodbath. I do believe that I learned a few things though. I need to be more flexible while drafting. I need to be able to recognize signals better, and I really need to ready to let stuff go. Instead of adapting, I am down to one draft set, but hey, at least I got a Grove of the Burnwillows. That's not very good compensation. So what do you guys think I did wrong? Did I get everything pretty much spot on? Let me know what you think, and please say hello if you see me on MTGO, my screen name is JXClaytor, and I would love to hear from you! I don't really like hate drafting unless there is not much for you in the pack. In both the tendrils and warpride cases I approve becasue there was nothing for you. My big weakness is that I can never remember what was in apack 8 picks ago becasue Tendrils so late means black is really open. If you switch to R/B remember that you need creatures. Idef think that was the open combination. I also think cannonade is better than Tolarian becaue at that stae I was not that excited about your blue. Warrens is still good becasue of Grinning Ignus but Kavu (and Sulferous Blast) are better. When you drafted the Warrens, you disqualified yourself from picking the telekinetic sliver. Also, telekinetic sliver works a lot better as a u/w deck where you can pick up poultices, sidewinders, opalines, lymphms later. Warrens is by no means a first pick card. It's only good if you have a lot of suspend, and at that point you don't know if you do. B, R, E, A, K - Warrens is an A, the Kavu is middling between B and R.
The only card that could even be considered is the Bonesplitter, and I'd have to question you on that. I think you can tell that the telekinetic sliver was your worst pick though. In TSP, you can't just pick the best card in the pack, you have to actually build a cohesive deck. Kavu / Isolation is a lot more cohesive and condusive to a good foundation that warrens / telekinetic. Then you watched as me sitting to your right just cleans up on solid white & red deep into packs. But I could because I didn't really overcommit to anything. Also, white has the deepest quality of creatures, red is ridiculously deep in TPF that it can support 4 players as their second color. Of course, we didn't find this out until Future Sight. Nice article Mr. Claytor. Reading a draft article from a writer honestly trying to improve his game and acknowledging his shortcomings is refreshing. I hope my comments here don't sound too harsh, as I really just want to make a few strong points to help you and other players out there. P1: Passing FMK. Wow, that's pretty awful. For future reference, Warrens is nowhere near as good now as it was in T-T-T draft since there are plenty of answers to it, including the ever-present Sprout Swarm. Grapeshot is a far better Storm card (best limited Storm card in the block, IMO). Warrens is still decent, probably best in UR, but it's not anywhere near as good as FMK. Keep in mind, FMK is usually a 3-for-1, sometimes *only* a 2-for-1. FMK vs. S.Blast is a tough call. FMK vs. Warrens really shouldn't be. P3: This early in the draft, you should *not* be thinking that you are already commited to two colors (unless you've drafting crazy bombs, but that's another story). Red is perhaps the easiest color to splash, and Blue and Green are the easiest colors to facilitate splashing a third color. So, at this point, you should be thinking "UX splashing Red," in which case, Nantuko Shaman, Spinneret Sliver, and Looter il-Kor are all excellent choices for you. Note: I still think Looter was the best pick here. P4: I would not have been worried about Red being cut here and been quite happy to pick the Red suspender, which combos excellently with ETW. BTW, I would have taken Crusader over the Giant anyhow, unless I was going RW with Warrens. P5: At this point I'm thinking G, W, and possibly B are open. Then again, this is 4211, so who can say. Again, it might have been just a bad pack. I might have taken Dralnu (thinking of Red as a splash) or the Dryad if I had taken the second sliver in pack 3. P6: At this point I have no idea what anyone behind you is drafting. Sentinel is solid for blue, but since blue is so deep it might not mean anything. The Cannonade red is still open (it tends to be over-drafted, so *any* removal this far along is a good sign). Cavalry and Burial are both playable (though pretty meh), and after a steady stream of white and black playables it's possible these colors are being under-drafted. No green to be found, which is odd after the excellent Dryad from the last pack. P7: Pretty good confirmation that Black is open. I'd be sad if I hadn't picked Dralnu. I'd take the Gorgon. P9: Here's where interpreting signals and keeping your options open pays off. A Tendrils this late is ridiculous and a golden signal that Black is being severely under-drafted. P11: I would have taken Ghostflame Sliver here. Anyhow, after the TSP packs, I'd be holding a Blue-Black deck with a possible Red splash. I notice that you kept getting passed excellent Black cards throughout the draft, and blue seemed to be cut in PLC. That's all part of the 4211 Experience (TM), I suppose. That said dispite kicking yourself about white you probably should have also gotten into black. Black was clearly open after then Tendrils wheeled. As far as commnet calling for more hate drafts, that is incorrect. Hate drafting is one of the worst things you can do in draft as there is a 1/7 chance you'll play that card round 1. Take a sideboard card for you deck before hate drafting something better. On khirareq's comments, Acid Moss is not that playable. I run it maybe 1 in 5 drafts I have one and I don't pick it often (and never high.) LD isn't that good in format as most decks have a solid mana base and while it accelrates you it costs 4 mana to do so and doesn't fix your mana. As far as the two white cards in Future Sight, they are decent but shouldn't be high picks. I consider both of them 6th-12th picks ideally. I think you should have done more hate picks instead of just filling up your colours. Some of your picks were just bad (but you recognised them all). Mvonwuli and Nantuko shaman are too slow in my oppinion (regarding the shaman i only mean that in comparison to the cavalry) and what your deck really lacks is EVASION. Good job on the article Josh. Even if you don't have perfect picks it lets us learn from your mistakes without having to fork out 3 boosters and 2 tickets. I think this is going to be a good learning expirence for myself. I'm honestly still learning the MTGO interface (I've mainly played constructed in the years that I have been there.) and I have let my limited skills diminish over time because of how much of an emphasis I put on constructed. As I think we can see, I still have a lot to learn in drafting this format. as for the shaman, I think he was too heavy into green for me to consider him. One of my biggest habits is I far to often let my opening picks dictate what I continue to draft. I have the fear of switching colors, and this has led to many poor situations, you know the ones, where you are struggling to find the 23rd card because you were dabbling in four colors. I think acid-moss does not do enough in the format. I also think that Field is a higher pick than cry, however, if you are in an aggro deck, than Cry is the better pick. I am sure that I will never pass a Kavu again. He's splashable, he's powerful, and he is a huge body. I think as I have continued to draft I have gotten a better hang of this, and soon the goals of this series will become reality. this draft deck could have been a lot different if you had taken the kavu first pick, and gotten into white. You didnt get any decent white in PC but that's probably because the person you passed all the goodness to took it. Also, IF you had been in white and had taken the 2 benalish knights I think Celectial Crusader would have been better than the Ivory Giant. With Shade of Trokair and Knight of the Sursi in FS you can still get plenty of suspend guys, and the combat/flash trick of crusader would have been huge on your 2/2 flanking guys. ...and I agreed with your assessment of what went wrong. I have a couple of questions, though. Pack 1 Pick 3 - I would have taken the Nantuko over the Cavalry, even having taken the Isolation in Pick 2. In my experience, the free beater is quite strong. Is that the right call? Does it require too heavy a commitment to green this early? Is the Cavalry just better? Pack 1 Pick5 - I had a tough time here deciding between the seekers and the dryad. The seekers is in my primary color and searchable by a Scout should I find one (unlikely at this point.) The dryad is evasion and card advantage, but with a heavier color commitment. What's the pick? I keep seeing late Mwonvuli Acid Moss. Why is that? Does LD and Accelleration not work in TSP draft? Marshalling Cry and Luminthread Field were coming around late too. Which is the higher pick? I am by no means an expert. Let me try to help with the first couple picks as the rest of the draft is hard to predict after changing picks. Pick 1 : You nailed this pick right on, after the fact. In my opinion, the only two cards to consider here are the Kavu and Tendrils. Kavu is a card you will almost always splash for making it the easy pick. The general rule is to pick bombs and then removal and I wouldn't consider EtW a bomb. When you could draft triple Timespiral I could see building your draft around multiple EtW's. Pick 2: Once again I like your revised pick here. The cards to consider being Isolation, Outrider, Sliver and Syphon Mage. Once again I prefer to not get color committed and choose the versitile removal in the Isolation. Pick 3: Looter is the top pick here. However given that an aggresive white 2 drop is available to pick and backs up the Isolation I like the Cavalry. Picks 4,5 your revised picks look good also. Pick 6 I would go with the Cannoade that you originally picked. Anyway that is my initial reaction. My best advice would be to weigh heavier on removal early in the draft. I think it is a good sign that you are able to go back and analyze and choose what would have been best. The next step is utilizing that the next time you draft.